Nutritional value of strawberry tart. Favorite dessert. We love the crust, the cream and the fresh strawberries. The downside is that you need to run to the market to get heavy cream, mascarpone and fresh strawberries, but you’ll be rewarded. I tried Vicky’s recipe (minus the almonds) last year on Mother’s Day and I’m stuck to it. 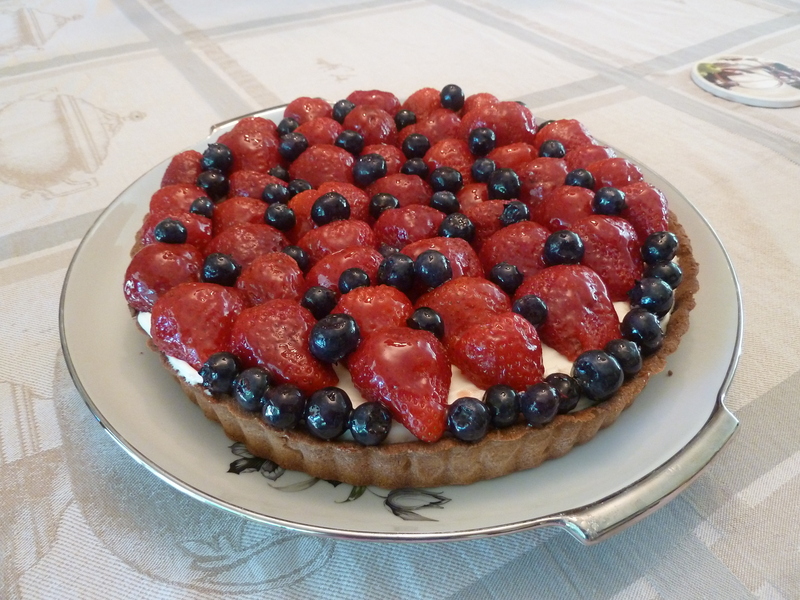 Last year I didn’t have a food blog so this is the debut post for the strawberry tart. How to make: To make the crust, combine the flour with the confectioner’s sugar and the butter. You can either use your hands or pastry dough blender to “rub” the butter on the flour until it’s become crumbly. Then add the egg and knead the dough lightly until it can form a ball. Wrap the ball in cling film and let it stand in the refrigerator for half an hour. When ready, use the cling film to spread the dough in a rectangular or round pan. It’s best to use the tart pans with the detachable bottom. Spread jam on the dough and use a fork to make some small holes. Bake it in a pre-heated 180C/360F oven for about 20-30 minutes or until it’s lightly browned. To make the cream, use a mixer to beat the heavy cream, mascarpone and sugar. Beat until the you get nice fluffy cream that “holds”. Spread it on top of the crush and put in the refrigerator. Wash and cut the strawberries. Dry them and brush them with apricot jam. Arrange them on top of the cream. Notes and tips: Instead of apricot jam I used left over raspberry sauce that I’d saved from the panna cotta recipe. I used it on the crust and on the strawberries. It tasted great! Credits: The pastry dough blender image is copyright-free from wikipedia. The recipe is from tastefull.gr. Last week we had guests coming from Virginia! A lovely Sunday with the perfect spring weather. Not too hot, no humidity, and no mosquitos! 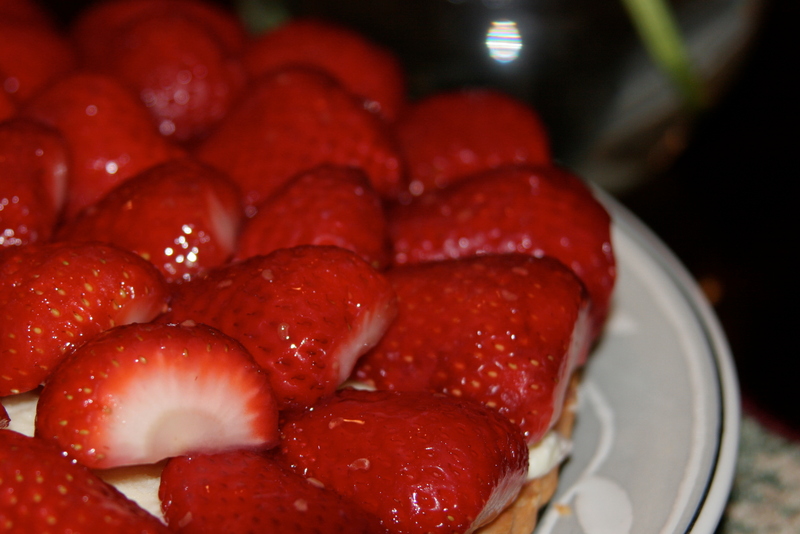 Perfect time for a strawberry tart. This time I added some blueberries, too. For the glaze, I used strawberry preserve after I heated about 2-3 tablespoons and strained to keep the chunky parts out. I LOVED the strawberry tart!!!!!!!!!!!!!!!! eleni – tha ithela na kano auti ti syntagi, alla nomizo exeis lathos metrisi gia to tyri. Les ml, omos to tyri metrietai se gr. mporeis na mou peis poso evales? Exo ena koutaki apo to trader joe’s pu leei 8oz (227 gr) einai arketo gia 9 inch tart? Episis, gia tin krema, htypises prota ti santygi kai meta evales mesa to mascarpone, i ta evales ola mazi? Alles fores exo ftia3ei tin tarta me krema augou kai heave cream apo pano alla tha ithela na dokimaso auti ti syntagi. Gia diafotise me ligo. Κι εγώ από το Trader Joe’s πήρα mascarpone. Πήρα δύο κουτάκια κι έβαλα ένα ολόκληρο και μια κουταλιά της σούπα από το δεύτερο. Για την κρέμα τα χτύπησα όλα μαζί αλλά τη άλλη την επόμενη φορά θα δοκίμαζα να χτυπήσω πρώτα τη κρέμα γάλακτος με την άχνη και μετά να προσθέσω το μασκαρπόνε για να δω αν θα βγει πιο αφράτη. Αν θες πειραματίσου. Πάντως και όλα μαζί να τα χτυπήσεις μια χαρά βγαίνει! Θα διορθώσω και τα ml σε gram… Thanks!